Welcome back to Emma and Brendan! I have to start out by saying that I’ve been waiting and waiting to read this book. Spellbound was one of my favorite reads last year and Spellcaster didn’t disappoint. We start out a bit after the ending of the last book. Emma and Brendan are still going strong (and all adorable about it). The aftermath of Spellbound is still hanging over their heads, and we see that in the opening pages. The action starts right off (not that kind of action, although, Brendan *le sigh*). Emma is attacked, being stalked by a new evil in her life. The story unravels quickly, bringing all the key players together. I loved having another story with Emma, Brendan, and Angelique. Emma continued to develop as a character, growing stronger in her powers and her disposition. I liked seeing her step out of her own llittle world a bit and grow as a witch and an individual. Brendan continued to make my heart go pitter patter like only Brendan could. His character continued to grow as well, and I loved seeing him try and be a better man for Emma. There really is nothing like a tortured soul wrapped up in a hot package. Angelique was also a fun character to discover a bit more about. I simply enjoyed having another look into the characters I fell in love with in book one. There is a lot more action in book two (yes, even that kind of action, oh Brendan *le sigh*), as well as more history for us to learn. Cara created a world full of love and magic that keeps you Spellbound from the first pages. Emma and Brendan are soulmates but their relationship is not perfect. They have to work to stay together, and I love them for it. Cara makes us see that the things that are most precious to us are worth fighting for. 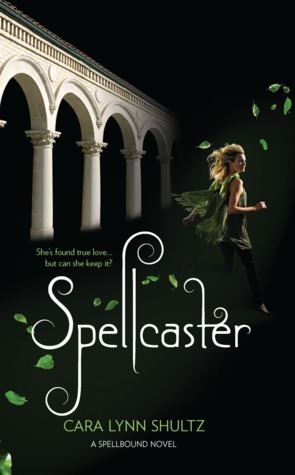 If you loved Spellbound, you will love Spellcaster. The story will cast a spell on you and keep you spell bound. This book comes out March 27th! What you think? Are you excited for this book? ← Blog Tour: On One Condition by Diane Alberts – Interview & Giveaway!